Netflix is by far the most popular streaming service currently available, with the number of subscribers hitting an all time high in the third quarter of 2017 at 110 million subscribers. Unfortunately, the content that is available for streaming to you is dependant on your location. The USA seems to take the top spot for amount of content displayed. Some shows available in the USA version of Netflix that are some of my favourites include The Walking Dead, Lost & The Office. Not too long ago, watching Netflix from different countries such as USA content from the UK was effortless. You could rely on free to use VPN’s in the form of web browser extensions to do the job. However Netflix chose to crackdown on this and start banning most major VPN providers out there. Even today, new VPN’s that pop up are brought down eventually. It’s a constant battle. In comes services such as NordVPN. It’s close to impossible to watch Netflix with free VPN’s now. With a large amount of users relying on free VPNs and heading to Netflix, it’s easy to ban the IP Address pretty much instantaneously. With it being free, developers aren’t inclined to update their VPN’s as soon as they go down. That’s why in this post, we’re going to look into NordVPN. We’ve chosen NordVPN as the Best Netflix VPN for December 2017! First off, what is a VPN? A VPN allows access to Geo blocked content. If you must be in Germany to watch something online, you can use a VPN to access it. It also helps avoid censorship in certain countries and schools. Give peace of mind and a sense of privacy by securing your data. Using a VPN helps prevent your ISP (Internet service provider) from gathering your data. Therefor also protecting it from your government. Allows you to use services such as Torrent clients safely. Your IP address isn’t placed in the list of peers, making you anonymous. Whilst you can use pretty much any VPN services, some are better than others. There are a lot of things to factor in, such as reliability, usability, server locations and speeds. We’ve chosen NordVPN due to how simple it is to use and being one of very few VPN providers which currently works with Netflix. Below are the prices of NordVPN as of November 2017. All packages include a money back guarantee. The best value of money would be the 2 Year Plan, where you save 72% compared to the monthly plan. However if you’re looking to test things out, I’d go with the monthly plan. These prices are very reasonable, if not cheaper compared to the other few providers who currently offer Netflix support. According to the FaQ of NordVPN, you are allowed a maximum amount of 6 devices connected to the VPN. This means you can watch Netflix through NordVPN on your Laptop, Computer, Tablet or even phone. The devices that can be used are endless. When enabled, NordVPN provides a feature called CyberSec. CyberSec, also known as CyberSecurity is a unique feature explicitly provided with NordVPN which promotes safe browsing by blocking advertisements, botnet control and malware attacks. When heading to a website which is potentially unsafe, NordVPN will check the site against its updates list of unwanted sites and block access. NordVPN has double data encryption. It doesn’t just secure your data once as it travels throughout the internet, but twice! Giving you even more peace of mind that your habits and browsing data are secure. Finally, a Kill Switch is implemented into NordVPN. Meaning that if your VPN Connection happens to drop out, NordVPN will shut down any site or software that is running in order to keep your identity and data safe. 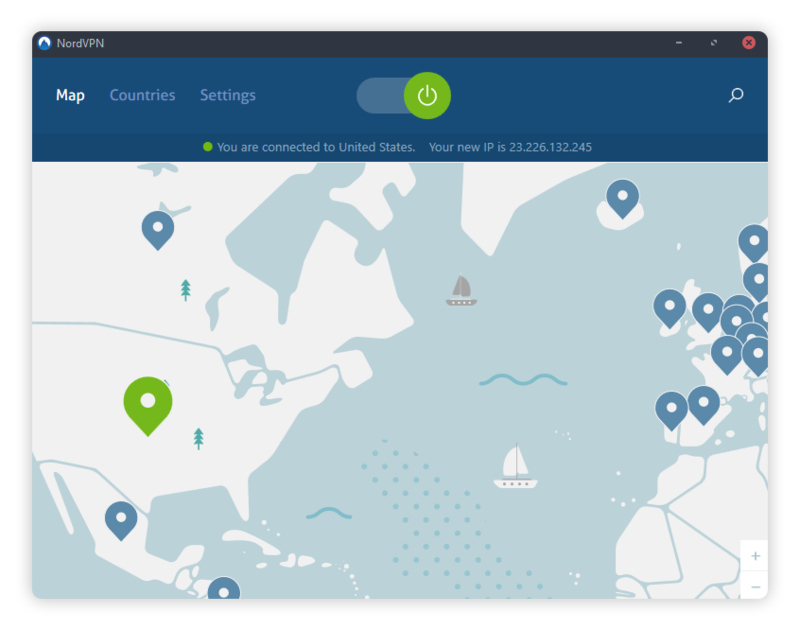 I was surprised with the simplicity of NordVPN. I’m from the UK myself, so the content I receive on Netflix isn’t really anything to complain about. However the USA still takes the top spot when it comes to the amount of content. For quick access, the first screen provided is a map. It’s very sleek looking, just pick a country and it will automatically connect to a given server. However if you want to browse server lists manually, just choose ‘Countries’ at the top. I was shocked that for the USA, there are literally hundreds of servers to choose from. Anyhow, I used the map for my first trial and selected the United States and let it pick a server for itself. Once I was connected, I booted up the Netflix app. (By the way, if you use Netflix on Windows, make sure to download the Netflix App from the Windows Store. Your web browser doesn’t allow you to watch Netflix in 1080P or higher!). Surprisingly, Netflix worked first time. A lot of new content was displayed on my home screen and the error message didn’t pop up. NordVPN is one of the best VPN’s I’ve come across yet. You can find out more about NordVPN on their site.